Ruby is a dynamic, reflective, object-oriented, general-purpose programming language developed by Yukihiro "Matz" Matsumoto in the mid 1990s. Ruby was influenced by Perl, Smalltalk, Ada and Lisp. It can be seen as multiple paradigm programming language. The name Ruby was mentioned since it was the birthstone of one of the colleagues of Yukihiro. 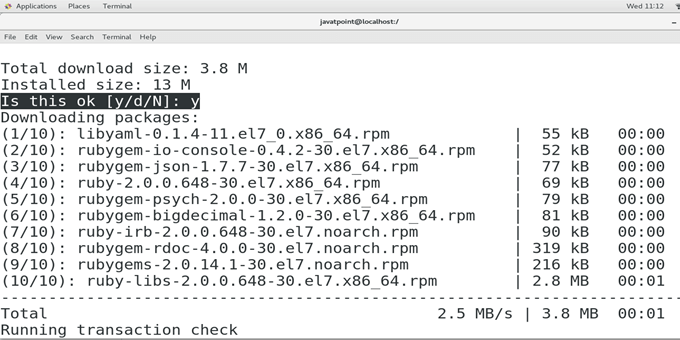 In this tutorial, we will install ruby on CentOS. First, we need to update the local repository index of yum. For this purpose, execute the following command. Run the following command to install Ruby on CentOS. To check, whether Ruby is installed on the system or not, run the following command which shows the version of Ruby installed. Well, we have successfully installed and get started with Ruby on CentOS.